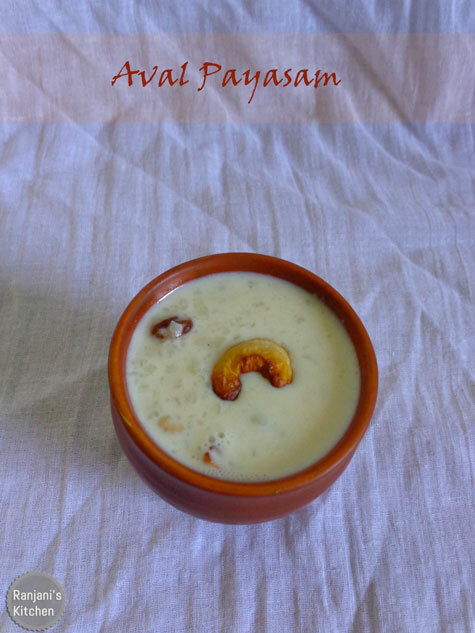 Aval Payasam – simple and easy dessert to make at home for festivals and neivedhyam. There are many variations to make this poha recipe. This method is to cook poha in milk and flavoured with cardamom and topped with ghee roasted nuts. Serve this payasam hot or cold. 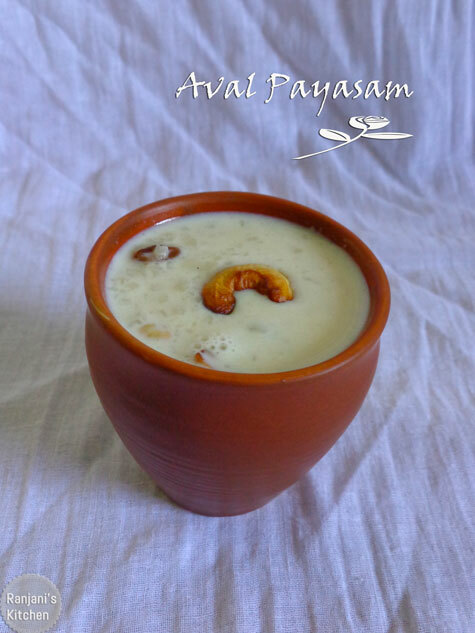 Here is the procedure for how to make aval payasam. Rinse poha with enough water and keep aside. Heat a non stick pan or kadai, add ghee,once it gets heated , roast cashews and raisins and keep aside. In the same pan, roast washed poha till the color slightly changes and keep aside. Boil milk, add sugar and roasted poha in it. After the poha cooked well and the milk slightly thickens, add cardamom powder ,roasted cashews and raisins. Allow to boil for 3 mins and turn off the flame. Adjust the sugar if you need more or less. Do not soak poha in water for long time. Simply rinse and roast. Also no need to roast poha for long time and it changes to brownish color. Roast in low flame till the color slightly changes. Instead of cardamom, you can use rose water for flavor. Hi, my name is Ravi and I am from Malaysia. I accidently stumbled into your blog and Aval Payasam caught my eyes and decided to make this to surprise my wife. Followed the details carefully and also read the recipe many times to understand it well. To my surprise and my wife’s too it was an amazing result. Thank you very much Ranjani.